Stock product - detailed vector illustration - Illustration Vector Collection - Cyclist Vuelta Winner Isometric People 3D - created by Aurielaki. Image formats EPS AI JPG. Vuelta de Espana 2016 Spain racing winning cyclist. Vector cycling icon. Cyclist icons. Flat 3D isometric people set of vector bicyclist icons. Isometric bicycle 2016 Cycling race icons. 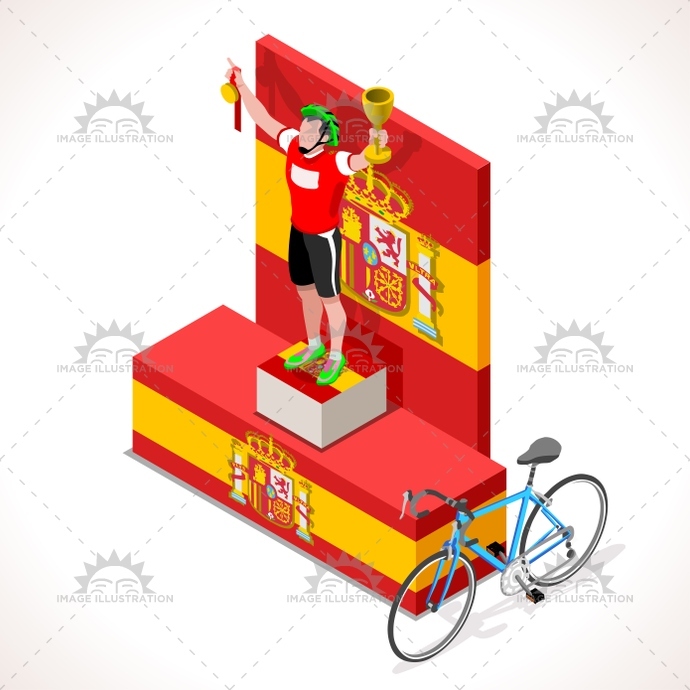 SKU: Cyclist-Vuelta-Winner-Isometric-People-3D-Vector-Illustration-AurielAki. Categories: Cycling Italy Spain France Tour, Isometric Sporting People. Tags: 2016, 3d, art, bicycle, bicyclist, bike, cartoon, character, clip, competition, competitiveness, Cycling, cyclist, espana, final, first, flat, graphic, group, icon, illustration, isolated, isometric, lane, logo, man, path, people, podium, race, riding, sign, silhouette, spain, sport, Summer Games, symbol, tile, tour, vector, victory, vuelta, win.